After the prior post on technology, I realized that there are other pieces to the Volt solution that need to be covered, especially in light of issues recently publicized about the Nissan Leaf and its battery, the Fisker Karma and its recent recall for fires, and for those with a longer memory - the fire in a Volt after a government crash test. It is one thing to make an electric car efficient in storing, turning power into motion, and reclaiming it as well. But, any electric car has to keep an eye on any energy lost that isn't helping keep the car moving. First and foremost, we have energy lost to the air the car moves through. This is why the Volt has the shape it does, but a few tricks are interesting to call out. 1. 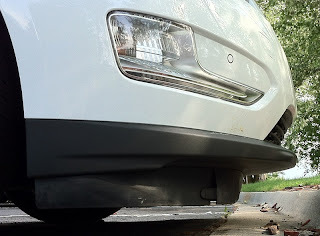 Keep air out from under the car. As slippery as any car looks, a large portion of the drag comes from what the air encounters underneath. Suspension parts, fuel tank, exhaust system, and any other parts that hang underneath all create resistance. One way to improve this is by streamlining the underside, but also, you can get big wins by preventing air from flowing under the car. The Volt takes advantage of the latter with a deep chin spoiler. Made of flexible rubber and missing the ground by just a couple inches - the Volt directs air around rather than under the body. The down-side is that the spoiler does drag on even slight imperfections and contours. Intersections that dip down then back up - you hear it rub. Pulling into driveways or parking lots that slant up from the road - drag again. It will either drive you crazy or you can think of it as a way you have something in common with an exotic sports car. GM does offer a spoiler with more clearance as an accessory - but you'll have to accept a mileage penalty for letting more air get under the car. 2. Mirrors. They stick out on any car like ears. Catching air that is accelerated by being pushed up by the hood and away by the windshield. They are encountering air moving faster than the car and turbulent to boot. You might notice the Volts aren't smaller but they are held away on wings. This gets them out of the most turbulent air for enhanced aero efficiency. GM reports that they are good for an extra 0.5 miles of range with this design. 3. Sharp rear corners. As important as managing how air flows around the car is how it leaves the car once it has passed through. 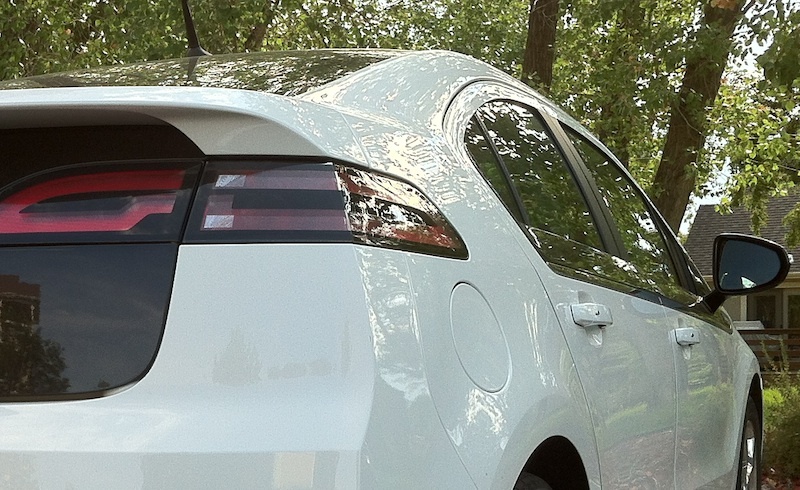 To make air cleanly break away from the sides, the Volt has sharp corners on the trailing edge of the sides. This makes the air separate rather than swirl around and continue to drag on the body as it passes through. Just further attention to detail that you see on this and soon most other cars as federal mandated mileage increases take effect. Tires not only hold up your car, they provide all the traction needed for accelerating, braking, and cornering. The negative is that they take energy away just to roll. Wizards at the tire companies have worked for years to make 'low rolling resistance' tires that attempt to have all the right amounts of traction with a minimum amount of drag. The Volt is equipped with Goodyear Assurance tires for that reason. Battery packs are new additions to a car. Lithium Ion batteries also have specific needs to have long lives needed in a car that might drive a couple hundred thousand miles. There are things that engineers choose to do or not do that affect the reliability and safety of the batteries and the vehicle occupants. 1. Lifespan of the battery. A Lithium based battery, like we mentioned earlier, doesn't react well to full charges or discharges. GM's answer is to equip the Volt with a larger than needed pack and never fully charge or discharge the cells - extending their range. Another piece to long-life is temperature extremes. A pack like that in a Volt, Leaf, or Fisker Karma do not like getting overly cold or overly hot. A way to control this temperature is to give the pack it's own dedicated climate control system. GM has decided to design in the ability for the Volt to heat or cool its pack to keep it within a healthy temperature range, but that is expensive. Recently, you might have heard a controversy concerning Nissan Leaf owners and range loss in their cars. While Nissan has ultimately decided that this was due to many of these cars being driven more than the designed for 12k miles per year - meaning that are more than a year into owning them as far as the engineers are concerned (figure that 18k miles would mean that the battery is more like 1.5 years of battery life into its driving). Also, many of these drivers also live in very hot climates (Arizona, for example). It might be significant to note that the Leaf has a heating system for its battery, but no cooling - depending on air-flow to keep the pack from overheating. This allows the Leaf to come in at a lower cost, but might ultimately end up meaning that Leafs (Leaves?) could take a certain hit in battery life-span. Time will tell. 2. Fire. Some time ago, the US government agency, NHTSA, conducted a crash test of the Volt. It was highly publicized that the Volt caught fire after the crash. What was not necessarily covered well was that it was well over a week after the crash test when this happened. Also, while NHTSA drains the fuel tanks of all crash test 'victims' the Volt's battery pack was left charged - leaving behind the energy needed to cause a fire. Even so, Chevrolet performed a running change and recalled 8000 Volts to install body reinforcements to prevent any intrusion into the battery pack area that could lead to a fire. It seems that the fire risk of battery equipped cars isn't unique to the Volt (recently, the Fisker Karma, another extended range electric, also had some bad press when a pair of their cars were lost to fire while in customer hands - though at least one of those was tied to a faulty cooling fan, not the battery pack). Even with thousands of battery powered cars on the road, equipped with unfamiliar technology to many, the fire risk does not appear to be significant compared to 'conventional' cars. So, the Volt is a high-tech car that has its own challenges that are largely shared with others of its ilk. Something that any owner should keep in mind if considering one of their own. Next up, our conclusion to our multi-part review of the Chevrolet Volt - Is it a Real Car?